Sign up with your email address to be the first to know about new posts! This post (probably) contains affiliate links and I may receive a small commission if you click one. This is at no extra cost to you and I'm incredibly grateful for it because it allows this site to keep running. Should you camp Okavango – or not? Our trip to the Okavango Delta would definitely fall into the ‘winging it’ category of travel. With no cell data and very little information, we arrived in Maun one evening with only a skeleton of a plan to visit the Okavango Delta the next day. We spent the night trying to research Okavango Delta campsites, trying to figure out how it all works. The little research we did led to few results. Turns out there’s not much information on Okavango Delta camping – or visiting the Delta in general – online. Unless you want to spend a fortune to stay at one of the painfully expensive lodges ($2,400 per night, anyone?) information is scarce. But we knew you could camp in the Okavango Delta and we couldn’t miss the chance to visit since we were passing by on our way back to Cape Town anyway. Turns out there’s just very little information online – and so we set off the next morning not knowing what was to come. RELATED READ: 30 things you need to know about Kruger National Park before you visit. It was about a 2-hour drive before we reached the first campsite. It was still far from the entrance gate to Moremi Game Reserve and something put it off me instantly: it was unfenced. We pushed on towards the south gate and, when we arrived, there was someone there to answer all the questions we had. He gave me the answer I didn’t want to hear: that there were three campsites in the reserve and they’re all unfenced. My heart sank and I held back the tears. I wanted to visit but I just didn’t know if I could handle a night of wild camping in Botswana. Before you judge me, let me explain. I was suffering from something I’d never had to deal with before: a new-found fear of elephants, an unsolicited souvenir from our Namibia road trip and something that felt like it became worse every day. And the thought of camping in a flimsy tent where elephants could roam freely terrified me. If there was ever a place to overcome a fear of elephants, it’s Botswana. A country of just ***, it’s home to % of the elephants in southern Africa. But I wasn’t sure wild camping with them was the way to go about it. I was tired from two weeks of intense travel, from Cape Town to Kruger via Lesotho, to Zambia via Botswana and back to Botswana again. I shouldn’t have any trouble sleeping at all. But as soon as I found out that we’d be out in the wild, the anticipation of a sleepless night took over. The tears came as soon as I picked up my vlogging camera. It was the hardest video I’ve ever had to edit and, if you’re subscribed to my YouTube channel, you may remember it. The thought of sleeping among lions and hyenas was exciting. As long as I didn’t need to pee in the night, there was nothing to be worried about. The elephants, however, were another matter. They’re the kings for a reason and they don’t let anything get in their way. If you thought honey badger don’t care…. Well, you’ve clearly never met an elephant. I spent the 2-hour drive to our campsite umm-ing and ahh-ing about whether I could actually sleep in a tent. 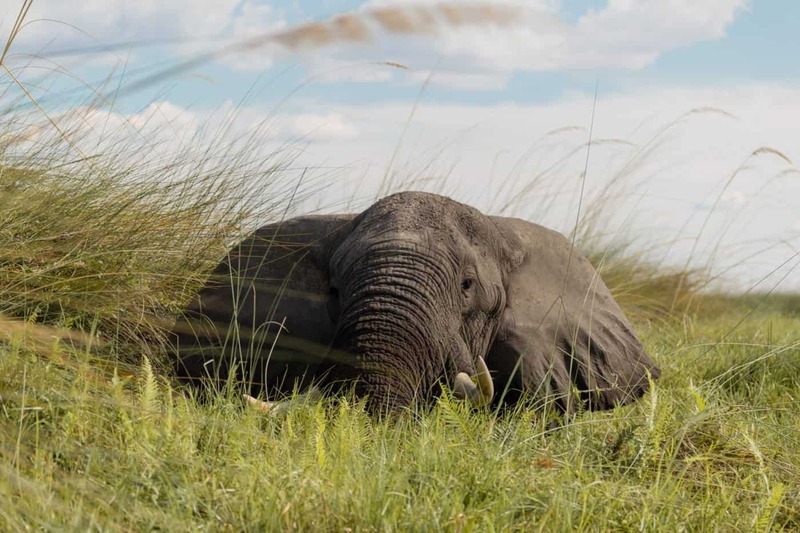 When we arrived to find a male elephant occupying our assigned campsite, there was no doubt in my mind – I was sleeping in the car. In the end, it was an experience I really treasure and would totally do again. We slept in the car and enjoyed a free night time safari when hyenas came into our camp just after sunset. There wasn’t an elephant in sight and I had a peaceful 9 hours of sleep. 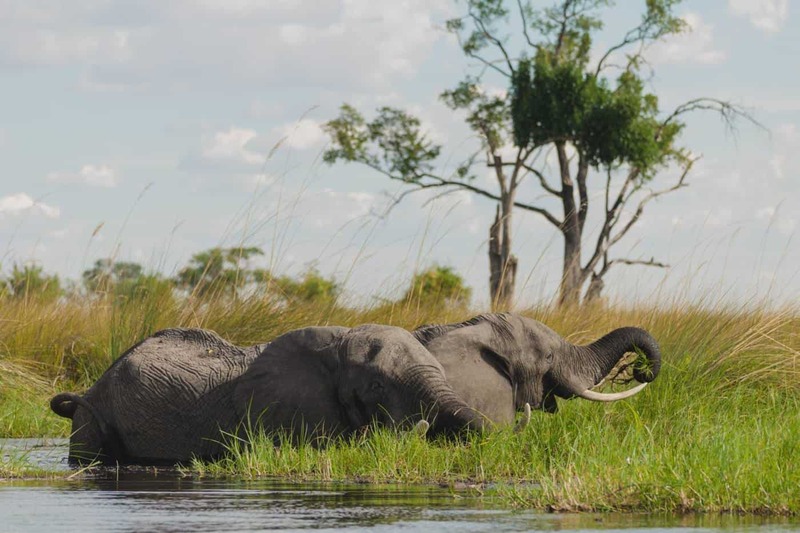 The Okavango Delta is one of those once in a lifetime type of places. The type of place you visit for a special occasion, like a honeymoon, anniversary or big birthday celebration. The kind of place you actually start a cheesy travel fund pot for (even though it can be surprisingly cheap to visit). 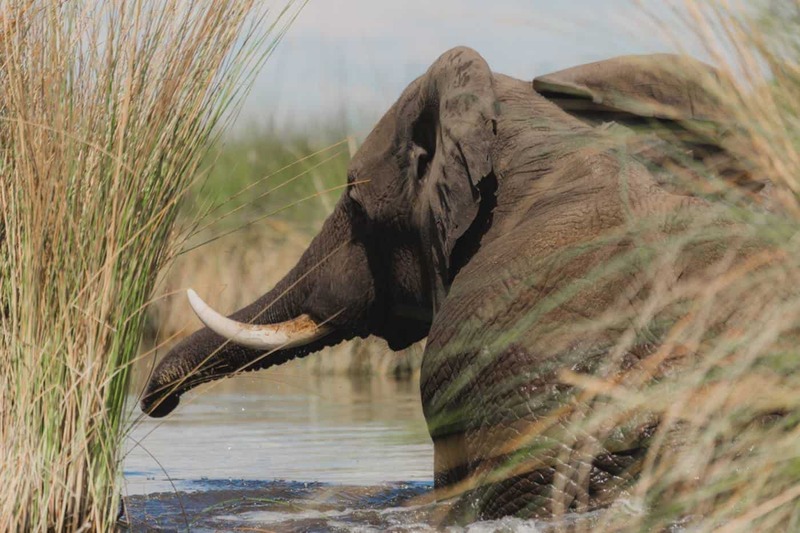 If you don’t want to wait for a reason to visit – or save up for years to do so – camping in the Okavango Delta makes it surprisingly affordable to visit. It won’t set you back anymore than a trip to many popular destinations. And for that reason, camping is a fantastic way to visit the Delta. There are four main campsites in Moremi Game Reserve: Third Bridge, Khwai, Maqwee (the south gate) and Xakanaxa. We decided to stay at the latter because there had been a wild dogs sighting that day. We didn’t get to see our wild dogs, but we did see plenty of wildlife. During our 12 hours there, we saw a huge herd of cape buffalo, hyenas, hippos and lots of elephants. Whichever camp you decide to stay in, you will need a 4×4. We were told that only ‘experienced’ 4×4 drivers can make it to Third Bridge and you needed to be confident to get to Xakanaxa. Aside from a couple of slippery patches, the road wasn’t as bad as we were expecting, but you might want to head to Khwai if you’re not a confident driver. The Xakanaxa campsite was surprisingly comfortable given that animals could roam freely. The ablutions were brand new, meaning we could enjoy a nice shower in the evening. The only thing you won’t find are braai or cooking facilities on-site. We kept it simple by bringing a box of protein bars to eat for dinner and breakfast. We were happy with the convenience but you might want to pack a barbecue if you’re staying more than one night. There’s also no internet, no ATMs and nowhere to buy food once you’re inside the reserve. It’s about as wild as it gets and you’re on you’re own, but that’s what makes it a great experience. If you’re visiting Botswana and want to try a different kind of safari, it’s one you’ll cherish forever – even if you’re scared of the elephants! 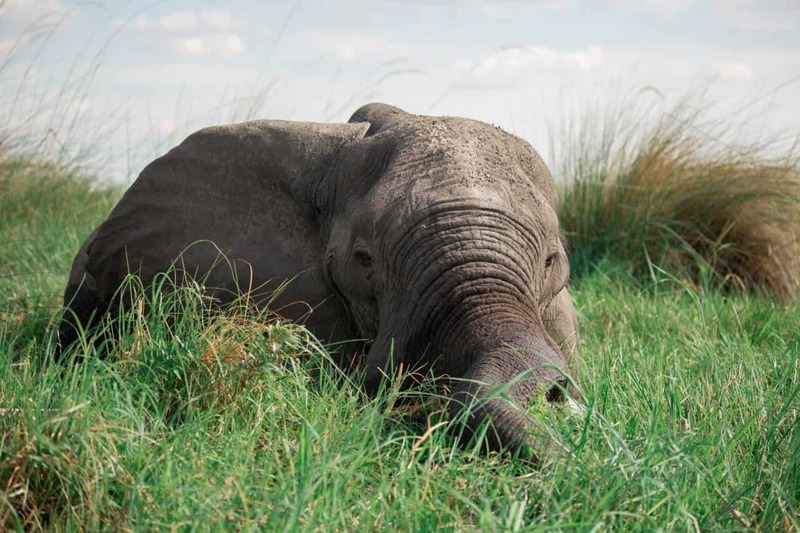 Planning a trip to Botswana or the Okavango Delta? Pin this post for later! A British travel blogger and vlogger who’s been travelling full time since 2017. 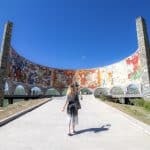 This travel blog is where I share the most unique experiences around the world and my tips about digital nomad life. 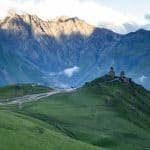 Alajode is a travel blog that focuses on unique and enriching travel experiences. I hope to inspire you to get out of your comfort zone – and then give you all the practical tips you need to do so.